RadChart supports grouping and aggregation. Which means that you can group the underlying data and apply one of the supported aggregation functions. This is a very powerful way to build charts that let you summarize business data in seconds. Grouping is a process which groups the data by one or more parameters. RadChart allows you to create charts showing the data grouped by one or more criteria. Using the specified criteria, RadChart will first process and group the data and second, will create as many series as needed in order to visualize the groups properly. Sometimes grouping data is enough, but often you might need to apply aggregate function like Sum or Count. The table below shows the data when the grouping and the Sum aggregate function are applied. Note how the values for each group (Year, Region) are calculated - as a sum of all the items in the group. As a result, for each group you will have one value: the sum of all Apples and Bananas consumed for the concrete year and region. GroupDescriptors - a collection of ChartGroupDescriptor s, one for each property from the underlying data which you want to group by. ShouldCreateSeriesForLastGroup - specifies whether or not a series to be created for the last group. To use grouping and aggregation functionality you need data binding via SeriesMapping/ItemMapping. You cannot group or aggregate when DataSeries and DataPoints are used. 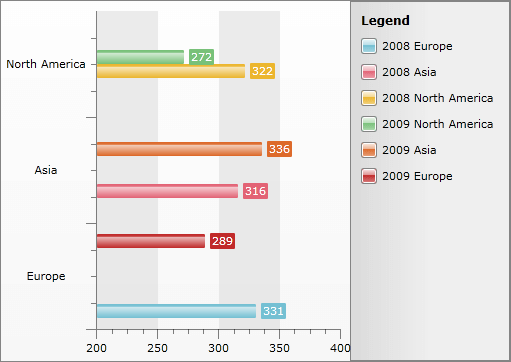 As you can see, when the data is grouped by Year and Region, six groups will be created: three groups for the three regions for year 2008 and three groups for the three regions for year 2009. As a result, RadChart creates six series - per one for each of the groups. Moreover, the Striplines and Gridlines display the Description so these six series are again grouped by the fruit name. Sum - calculates the sum of all values. Count - calculates the total number of the items. Min - returns the minimal value. Average - calculates the average value. Max - returns the maximum value. 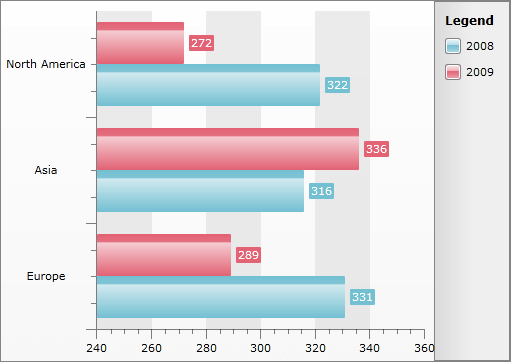 First, the data is grouped by year, then by region. For each region, Sum function is applied to calculate the Y-Axis value. 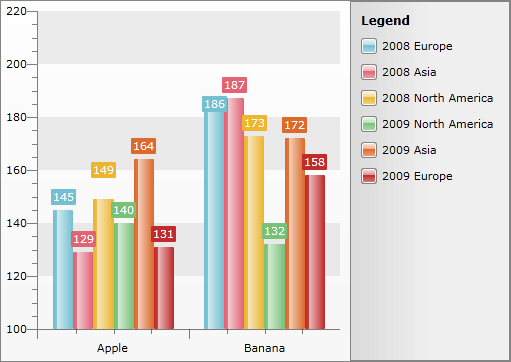 In this case -the sum of all the apples and bananas consumed for that year and region. When False (default), RadChart will not use the last group level for generation series. When True, RadChart will create series for the last group. The last example does not specify explicitly the value for ShouldCreateSeriesForLastGroup, so RadChart, by default, will not create series for the last group - Year. From the snapshot you can see, that two series are created - one for year 2008 and one for year 2009. The values for these two series are actually the result of the applied aggregate function (Sum) over the last group level. The RadChart will use the aggregated values from the second group descriptor (Region) and for each region it will create DataPoint for the appropriate series based on the the parent group (Year). Note, that the values are exactly the same as when the ShouldCreateSeriesForLastGroup__is set to __False, but instead of 2 series now RadChart created 6 series. ShouldCreateSeriesForLastGroup is used only when an aggregate function is used. If no aggregate function is used, ShouldCreateSeriesForLastGroup is omitted. First, a new SeriesMapping is created with BarSeriesDefinition. See Data Binding Support Overview for more information. Second, two ChartGroupDescriptors are added to the SeriesMapping.GroupSettings.GroupDescriptors - one for Year and one for Region. Third, via ItemMapping, the Region is bound to the X-Axis using XCategory. Thus, Categorical Chart is built. See also Data Binding with Manual Series Mapping. Forth, via ItemMapping, the Value is bound to the Y-Axis. Additionally, the data is aggregated using the Sum function. Thus, the value shown on the Y-Axis will be the sum of all the fruits consumed for a certain year and region.